Starshrooms are mushroom-shaped starships found in Super Mario Galaxy and Super Mario Galaxy 2. They were built by the Lumas and Toad Brigade for the team to use it to help Mario (or Luigi) on his quest to find all the Power Stars. The red and the yellow Starshroom in the Space Junk Galaxy. After Mario or Luigi rescue the Toad Brigade in the Honeyhive Galaxy, the Toads relocate their base of operations to the Garage of the Comet Observatory and start building the red Starshroom with the help of the Lumas. Starshrooms appear to resemble the ship Rosalina used in her early travels of the universe, as seen in her storybook, and could have been modeled after it. 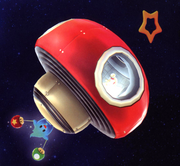 Once Mario recovers seven Power Stars, the red Starshroom is fully constructed, and can later be seen exploring many different galaxies, including the Space Junk Galaxy, the Ghostly Galaxy and the Sweet Sweet Galaxy. Even a sunken Starshroom can be found, on the sea floor of the Drip Drop Galaxy and the Bubble Breeze Galaxy. The Starshrooms usually act as platforms, and the Toads are rarely seen actually inside one of them. One instance of the Toads using them is in the Ghostly Galaxy. The captain is inside the green Starshroom, telling Mario that the Toads ventured out and have not returned. At first, there only appears to be a single, red Starshroom. However, as the game progresses, four additional Starshrooms, all color-coded for the rest of the Toad Brigade can be seen at certain points, such as during the Purple Coin challenge in the Sea Slide Galaxy. Only "the Starshroom" is mentioned by the Toads, however. The ending cinematic that is shown when a player gets all 120 stars then defeats Bowser shows a ruined rusty Starshroom left behind when Rosalina and the Lumas leave. The character Luma comes out from behind it. This alludes to Rosalina's story as the picture of the crashed ship the little girl finds the lone Luma in resembles this ruined Starshroom, and it is implied to be the Starshroom used by the young Rosalina. In the Grand Finale Galaxy (Mushroom World), the red Starshroom and Toad Brigade can be found, revealing that the ship and its occupants returned to the Mushroom World after the events of Super Mario Galaxy. Starshroom in the Spin-Dig Galaxy. The Starshroom also appears in Super Mario Galaxy 2. The alternatively-colored Starshrooms also appear. Notably, these Starshrooms do not seem to be the same ones from the original; it is revealed when Mario first meets the Brigade that one of the Lumas who fell down in front of Peach's Castle during Bowser's raid helped the brigade to build it so they could go into space. This seems to support the theory that this Toad Brigade may be an entirely different group of Toads than those in the original. The red Starshroom is constantly in orbit around Starship Mario and can be visited by stepping on a Warp Pad on Starship Mario which is next to the Yellow Toad. The Starshroom always has one 1-Up Mushroom on it. The Starshroom and its other versions appear in various galaxies as platforms. Often one of the Toads will be on it. The Toad Brigade and the red Starshroom reappear in Super Mario Odyssey. The Brigade uses it to fly to some kingdoms after Mario has collected all the Power Moons in that kingdom. In the Lost Kingdom, they are there when Mario arrives, using the interior of the Starshroom as a Crazy Cap shop. The ship can also be found in the Moon Kingdom and the Mushroom Kingdom of the game. Only the red version appears in this game. Only one Starshroom appears in this game. It is found in the course, Rosalina's Ice World. The Starshroom is red in color and is found half buried in the snow inside the cavernous area. It only acts as a background element and does not affect racers. In Captain Toad: Treasure Tracker, the Starshroom appears orbiting in the background at the beginning of the Coins Galore stages. It is also visible for a brief moment during the end credits cutscene. A red miniature Starshroom can be seen on the right side of the Rosalina Board in Mario Party 10. It is only a background element. In Super Smash Bros. for Wii U, two Starshrooms (Red and Yellow) can be seen flying above the stage based off the Super Mario Galaxy games. They are merely for decoration, similar to Mario Kart 7. All five Starshrooms can be seen in Sea Slide Galaxy's Purple Coin mission in Super Mario Galaxy, and in the Rolling Coaster Galaxy in Super Mario Galaxy 2. This page was last edited on September 27, 2018, at 20:04.